Winner of the 2009 Golden Heart® for Best Paranormal Romance for her manuscript FIRST GRAVE ON THE RIGHT, Darynda was born spinning tales of dashing damsels and heroes in distress for any unfortunate soul who happened by, annoying man and beast alike. After the Golden Heart final, she pimped herself as best she could, landed an amazing agent and sold to St. Martin’s Press in a three-book deal. Darynda lives in the Land of Enchantment, also known as New Mexico, with her husband of more than 25 years and two beautiful sons, aka the Mighty, Mighty Jones Boys. She can be found at http://www.daryndajones.com/. Darynda Jones is author of First Grave on the Right which won the 2009 Golden Heart® for Best Paranormal Romance along with two other novels in her Charley Davidson series; Second Grave on the Left and Third Grave Dead Ahead which is coming out in January, 2012. Holly: Hi, Darynda! Would you tell us a little bit about yourself? Darynda Jones: Sure! And thanks for having me! Sadly, there’s not much to tell, really. I’ve been writing forever. I started writing seriously in 2002, finaled in the prestigious RWA Golden Heart in 2009, landed an amazing agent soon after that and sold soon after winning the Golden Heart that summer. It’s been an absolute dream come true. Holly: Do you remember how your interest in writing began? Darynda Jones: I remember writing my first play when I was six. Before that, I would scribble stories onto paper. The need to write, to create, has always been inside me. Right next to my liver, I think. Holly: Could you tell us a little bit about your first novel in your Charley Davidson series, First Grave on the Right? Darynda Jones: I love writing Charley, just so you know. She is everything I would love to be. She says what’s on her mind without worrying about the consequences. I worry about consequences to the extreme. I under-tipped once. It’s haunted me for years. In a nutshell, Charley Davidson is a PI who was born the grim reaper. She solves mysteries for both the living and the dead. And they both get her into all kinds of trouble. I basically wanted a strong, independent heroine who was thrust into a paranormal world within an everyday setting. She has to walk the line between both worlds all while juggling her day job, dead people popping in and out of her life, and a super hot love interest who definitely keeps her on her toes. Holly: What was your inspiration for this novel and the writing process like? Darynda Jones: My inspiration was every strong female lead I read about and watched on TV. I love Buffy, Stephanie Plum, Eve Dallas, Sydney Bristow, Lorelei Gilmore, and on and on. Throw them into a pot, toss in a pinch of ADD, and you have Charley Davidson. Her skills at sleuthing involve more than her fair share of luck, but she looks good doing it. Darynda Jones: Definitely the characters. Holly: Your second novel in the series was also published this year, Second Grave on the Left. Can you tell us a little bit about it and how the characters and plot progress? Darynda Jones: In Second Grave we get to learn a little more about Charley’s love interest, Reyes, and we get to see Charley in action. Now that the introductions are out of the way, we get to focus more on Charley and what she does best. That’s right, comebacks. But there is a real mystery with her best friend/assistant Cookie’s friend missing. Also, Reyes is insisting that he doesn’t need his corporeal body anymore, and since it’s being tortured by demons (a ploy to lure Charley to them), what better time to be rid of it? Unfortunately, there are other considerations, like the fact that he has the power to bring about the end of the world. So Charley has her hands full what with finding a missing woman, dealing with her father’s past, and stopping the destruction of the Earth. All in a day’s work. Holly: Did you have a harder time writing the second novel than the first in this series? Darynda Jones: Actually, no. By that time, I was so into Charley’s head, that the story flowed much nicer. Now, making it a stand alone, as all books must be, even in a series, was not as easy, but with my editor’s help, I got that down as well. 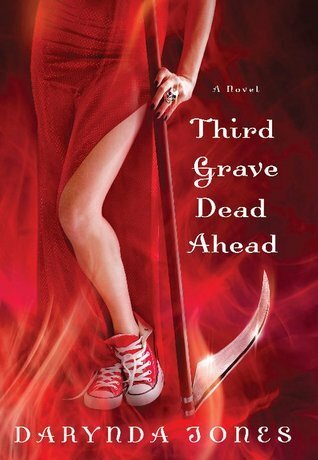 Holly: Your third novel is set to come out in January 2012 called Third Grave Dead Ahead and I admit I am curious to know all about it, and I love the names of these books! Very catchy, would you mind if I asked did you come up with them? Darynda Jones: I did, yes, although Third Grave was originally titles Third Grave Straight Ahead. My web designer emailed me one day. She hated typing the word Straight over and over and asked if we could change Straight to Dead. I loved it! I wrote my editor immediately with the change, and Third Grave Dead Ahead was born! Holly: Do you think this going to be the last book in the Charley Davidson series or do you have future books in mind? Darynda Jones: Books 4 & 5 have already sold to St. Martin’s Press, so definitely more. And I have plotted beyond that. We are hoping for a longer series. Holly: You have a YA series coming in April 2012, the first book Death and the Girl Next Door. Can you tell us a little bit about this novel? Holly: Did you already have the Darklight series in mind or did you set out to write a YA series? Darynda Jones: Well, I wrote YA long before I wrote adult. In fact, Death and the Girl Next Door was written years ago, long before First Grave. First Grave just happened to sell first. It went through many title changes and we only recently settled on DATGND. I also have two other YA series in the works. Okay, I have dozens of series in the works, but I have two that I’m determined to complete and submit in the works. I love writing YA. Holly: Are you reading anything interesting at the moment? If so what? Darynda Jones: Well, I’ve only recently discovered Jeaniene Frost, so I’m reading her Cat and Bones series right now and loving every single delicious moment of it! Holly: Thank you so much for being here today, Darynda! Darynda Jones: Thank you so much for having me!!! Darynda Jones has offered to giveaway winners choice of either a signed copy of First Grave on the Right or Second Grave on the Left to one lucky winner.